Jonathan Fulford of Monroe (from front to back), John Dillenbeck of China, Amy Grant of of Belfast, Ethan Shaw of Belfast, Greg Stafford of Monroe and Aaron Bauman of Belfast train at just under 30 rowing strokes per minute aboard the team's 32-foot Cornish pilot gig in Belfast harbor Thursday evening, July 26, 2012. Their Come Boating! team recently won the 20-mile Blackburn Challenge, circumnavigating Cape Ann near Gloucester, Mass. Not only did they win, they may have set a course record. Race coordinator Malcolm Gater of Belfast holds a line to the team's Cornish pilot gig, the Belle Fast, as the crew gets ready to offload after a training session in Belfast harbor Thursday evening, July 26, 2012. On the far left is crew member John Dillenbeck of China. Members of the Come Boating! crew row their 32-foot Cornish pilot gig in Belfast's harbor Thursday evening, July 26, 2012. From left are coxswain Rick Fitzsimmons of Belfast, Jonathan Fulford of Monroe, Ethan Shaw of Belfast, Greg Stafford of Monroe and Aaron Bauman of Belfast. 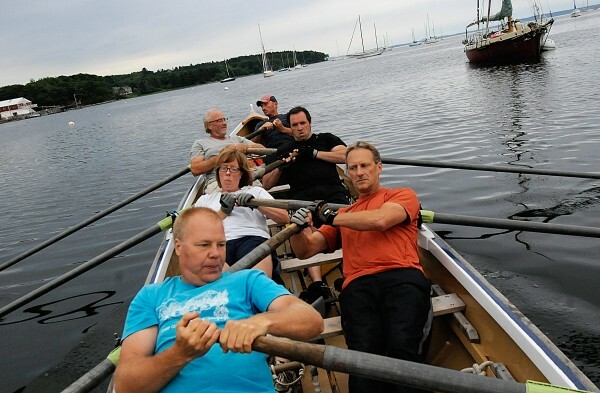 Jonathan Fulford of Monroe (from front), John Dillenbeck of China, Amy Grant of Belfast, Ethan Shaw of Belfast and other members of the crew (obscured) row at just under 30 rowing strokes per minute on their team's 32-foot Cornish pilot gig in Belfast's harbor Thursday evening, July 26, 2012. Their Come Boating! team recently won the 20-mile Blackburn Challenge, circumnavigating Cape Ann near Gloucester, Mass. Not only did they win, they may have set a course record. Wesley Reddick of Belfast (standing on floating dock) helps fellow crew member Amy Grant of Belfast from the team's Cornish pilot gig, the Belle Fast, as other crew, including Jonathan Fulford (left) of Monroe, John Dillenbeck of China, prepare to offload after a training session in Belfast harbor Thursday evening, July 26, 2012. BELFAST, Maine — The sextet rhythmically rowed the 32-foot-long gig, speeding lightly over the surface of Belfast Bay. It’s a common sight in Belfast, where the crew trains for upcoming races, but it’s still one that causes passers-by to stop and watch awhile. They might not realize, but they’re watching a top racing crew that has been making a name for itself around New England. 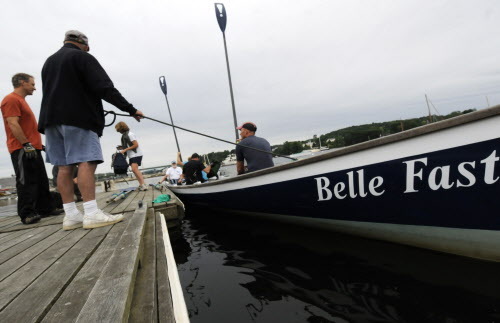 Most recently, the gig rowing crew brought home to Belfast a victory and a course record from the Blackburn Challenge, a 20-mile open-water race around Cape Ann, Mass. The crew of four men and two women from the greater Waldo County area made it around the cape on July 14 in just over three hours in their Cornish pilot gig. The nearest competition in their pilot gig class was 46 minutes behind them. The 47-year-old builder from China said that the crew had trained hard for the Blackburn Challenge, logging two-and-a-half-hour rows around Belfast Harbor and Penobscot Bay. Cornish pilot gigs have a long history. They were developed in the early 1800s in the Scilly Isles, 40 miles off the coast of Cornwall in England. The boats were designed to be fast and seaworthy, so they could transport local pilots to incoming sailing vessels. The first pilot gig to reach the ship would win the profitable job of guiding it safely through the shoals, so there was a built-in incentive for the oarsmen to be extra speedy, according to the website for Come Boating!. Though gig rowing is a very popular sport in the United Kingdom, according to Dillenbeck, it really hasn’t made such a splash on the west side of the Atlantic as of yet. Gater, who is British by birth, said that he formerly had worked as a harbormaster in Newquay in Cornwall and had rowed and coxed on occasion. Shortly after he moved to Belfast in 2004, he was stunned to see a notice posted looking for people to row a Cornish gig, and discovered Come Boating! that way. 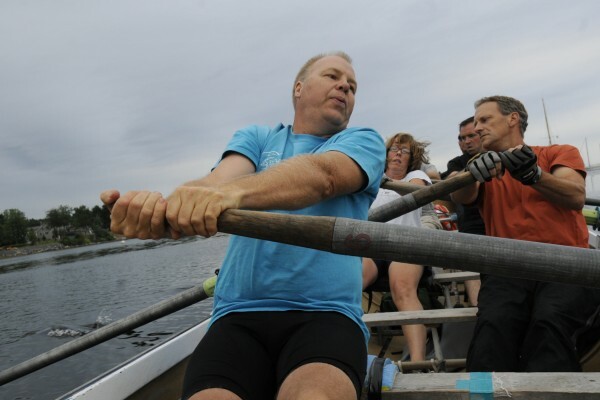 But despite the hard physical work associated with this kind of rowing, it can be quite meditative, some rowers said. “You just lose yourself in the rowing,” said Monica Piccinini, 46, of Belfast. Something else she appreciates is the community of rowers she has found since starting with Come Boating! four summers ago. Dillenbeck said that he used to be a committed runner, but a bad car accident that shattered his heel eventually put a stop to that sport for him. But he has found that gig rowing is a worthy substitute. After the Blackburn Challenge, it took a couple of days to feel right again, he said. But all those muscles surely will have recovered for the next big race on the gig rowing crew’s schedule: the 12th annual Come Boating! Regatta, set for Saturday, Aug. 18. For Piccinini, the drive to race is bound up with the sheer love of rowing. 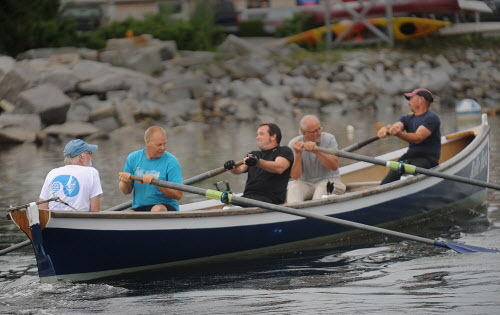 That feeling is so strong with the Belfast-based crew that the day after the Blackburn Challenge they decided to take the gig the Selkie for a row in the harbor, despite sore muscles and aches.